Skindred’s metamorphosis from ragga-metal firebrands to British rock’s primarily party-starters has been documented well, as long as you focus solely on their live performances. Their reputation’s not for nothing, and given how adept Benji Webbe is at working a crowd, coupled with a sense of humour that most bands seem allergic to, it’s no wonder that Skindred have garnered as much praise for their shows as they have. Their albums, on the other hand, have rarely held up, and while it’s easy enough to dub them a singles band now, the fact that earlier efforts like Roots Rock Riot and Babylon are still great today makes that feel a bit hollow. But the sad fact is that Skindred’s star has fallen considerably in their move to more straightforward hard rock and alt-metal, even in their better late-period work; few people will have listened to Volume of their own volition past 2015, that can be pretty much guaranteed. With all that in mind, Big Tings arrives at a curious position in Skindred’s discography, in that it actually feels as though it was made to embrace the ephemerality that so much of their work has stumbled on by accident. It’s easily their most basic and straightforward rock album to date, but at the cost of so much that made them so interesting and exuberant. Instead, this is a back-to-basics approach in the least effective way possible, and ultimately ends up with Skindred sounding like one of the tired, past-it rock bands that they were once the complete antithesis of. And it’s so easy to explain how this has happened – by scaling back the core elements of reggae, hip-hop and electronica, what’s left is a half-baked representation of no-frills metal that doesn’t amount to much. Of course there’s the odd moment that does manage to connect like the fat grooves of That’s My Jam or the more energetic drum ‘n’ bass of Alive, but primarily, Big Tings rests in a well-carved groove of mid-paced, rather inoffensive riff-rock with precious little to offer. The title track and Last Chance may plod by under the weight of crashing, lockstep drums, but they’re not exactly awful; what’s worse is when Skindred forgo any possible drive or vigour, like on Tell Me which genuinely sounds like a Creed song, or Machine’s embrace of uninspired dad-rock tones, both in its trite, repeated refrain of “Rock ‘n’ roll will save my soul” and the fact that it’s a duet with Reef frontman Gary Stringer. It’s a real shame, especially considering how Skindred’s instrumental colour was their best feature to offset a lack of real lyrical substance, but the fact that Big Tings drastically simplifies the former without touching the latter leaves it with such little weight. Sure, the fact that it’s primarily a party album means that it doesn’t have to a paragon of detail and depth, and the title track and Broken Glass are at least a little more inward-looking that what you’d typically expect, but this is still as thin overall as what you’d expect from Skindred. There are no real standout lines or even hooks, meaning that Big Tings ends up slinking into the background of Skindred’s catalogue more than any of their previous output ever has. If Benji Webbe wasn’t as distinct or charismatic as a vocalist, this would be written in a much different tone rather than merely ambivalence. But let’s face it – as long as Skindred can churn out a couple of good singles per album, it’s not as if anyone’s that bothered otherwise, and Big Tings will probably be able to do that. But that doesn’t stop this album from showing a band at their lowest and least substantial, with barely any of the fun factor that made this band so appealing. Still, if Skindred’s track record is anything to go by, this will probably be forgotten before long, and that might be for the best. 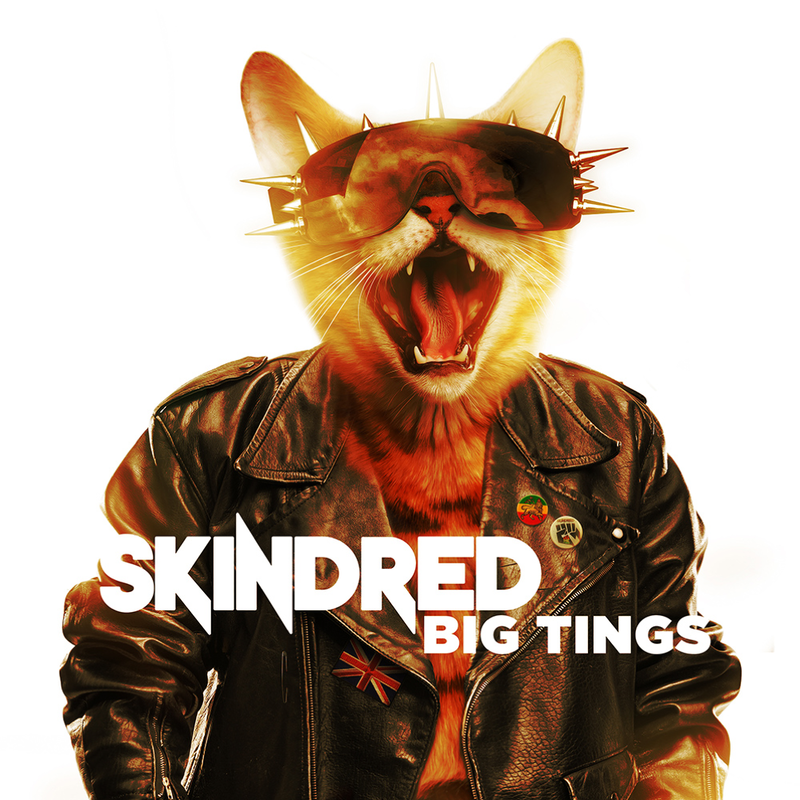 ‘Big Tings’ by Skindred is out now on Napalm Records.